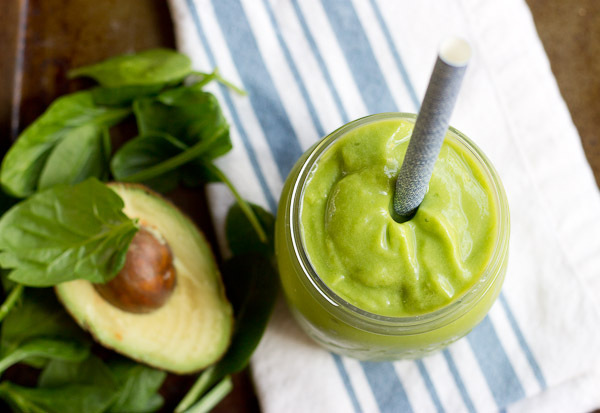 Get your greens on with this Avocado Green Smoothie. Good fats, lots of greens and tastes delicious! Great way to start the day! 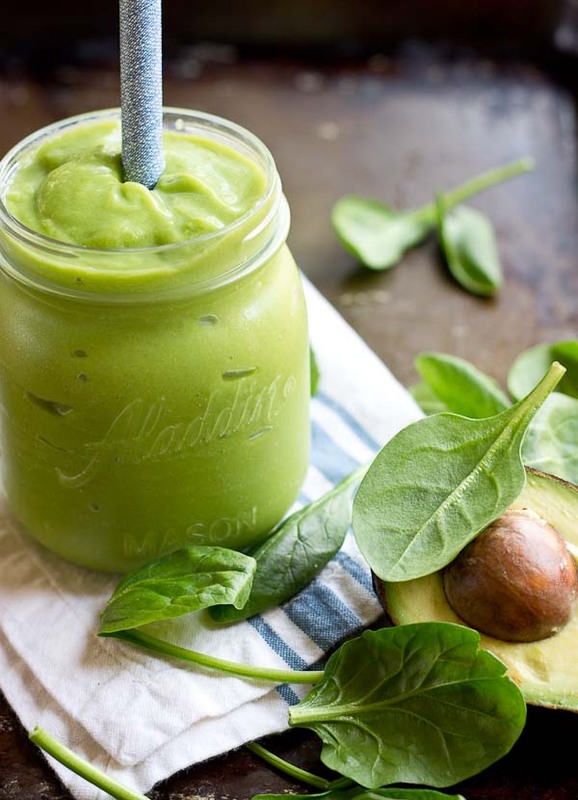 Avocado Green Smoothie is a dairy free coconut milk smoothie that’s packed with nutrients for a veggie forward breakfast! Hey friends! Happy New Year. I hope you all had a wonderful holiday and feel well rested and pumped about 2016. We spent both weekends with family and friends back home which was really nice yet busy – I especially enjoyed the past two weeks because Eric took some time off which made us feel like a family again. 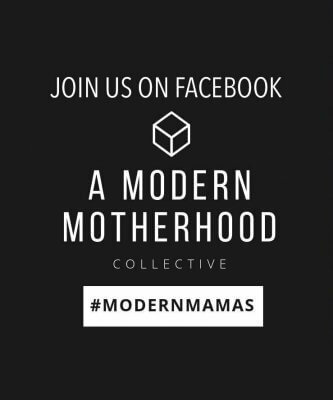 He was working around.the.clock last month preparing for a trial PLUS I’m getting like zero sleep taking care of our newborn which means we were in MAJOR need to some time downtime together. 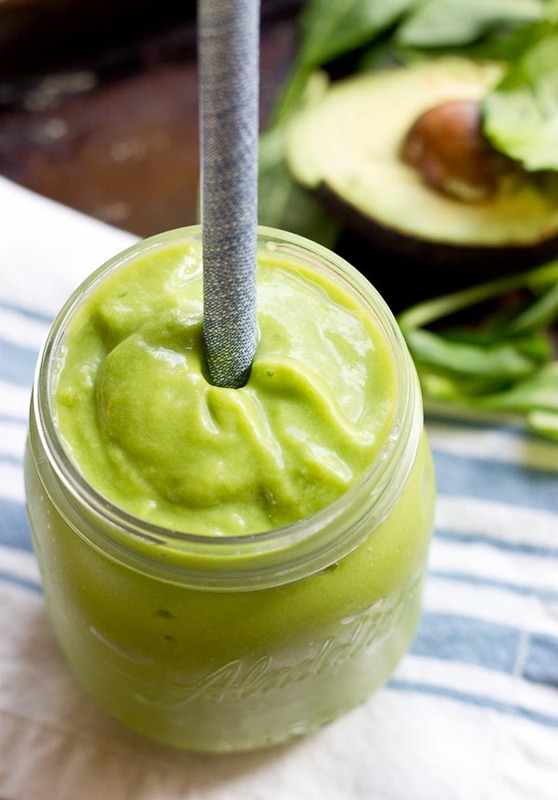 Since it’s a fresh start and a New Year and people like healthy things, I’m kicking off this first Monday with this Avocado Green Smoothie to start the first ever “Smoothie Week” on Love & Zest! Hope you’re ready for some delicious green smoothie recipes to get your year started on the right track. 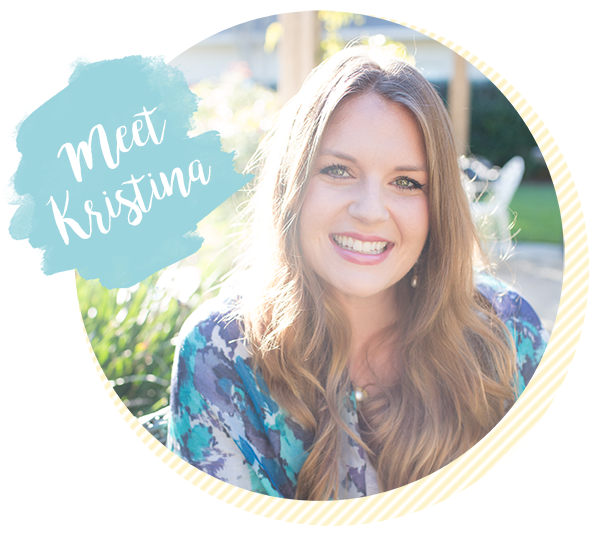 I love using the blender to get all my greens in, especially now-a-days with a little one in my arms so drinkable nutrition has been the name of my game! Also, I’ve been really craving all the greens I can get because I’ve been under the weather the past couple days – stuffy nose, itchy throat, cough, ick. Sleep deprivation is running me down and putting a damper on my immune system. Just praying I can recover from this cold fast enough and that the little guy doesn’t catch it too. One of my goals this year is to add nutrition facts to my recipes and if you need nutrition information on an old recipe, just let me know and I’ll get that to you too. 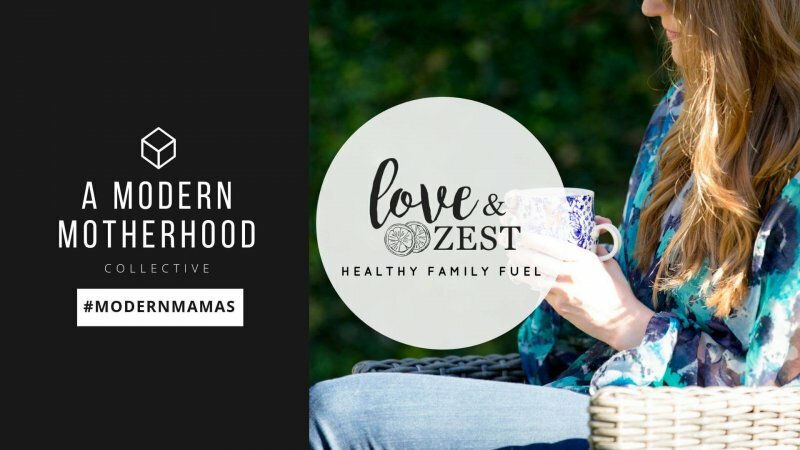 Also, I’ve added Pinterest friendly images to each blog post! Thanks to you all that are pinning my images 🙂 So for all you pinners out there, these photos can be found by clicking the “Pin It” button below each post or on your web browser toolbar. You can pin any picture on my site, but the Pinterest inspired photos will be at the bottom of the post.I’ve also added a YUM icon to the bottom of each post so that you can “yum” images a lot easier from the site. Hope you enjoy smoothie week and that 2016 is off to a great start! I’ll be back tomorrow with another smoothie recipe so get your straws ready. 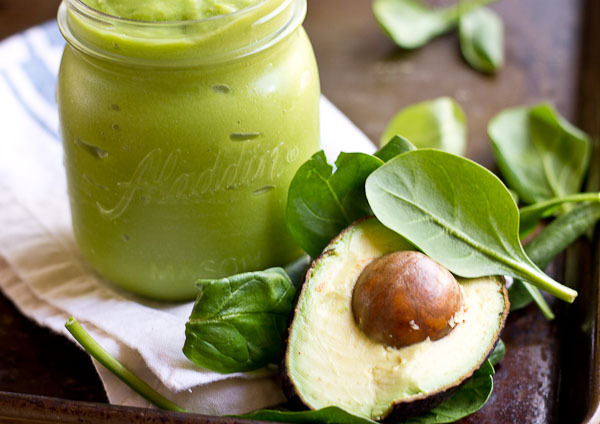 And in the meantime enjoy some of my other green smoothies recipes! 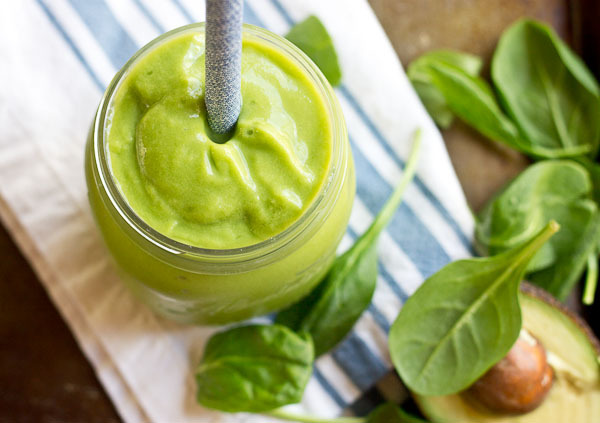 Blend all ingredients in blender and process until smooth and creamy! Serve chilled. I love your smoothie recipe with coconut milk. I have yet to venture into adding coconut milk into my smoothie as I am not too keen on canned coconut milk (I can’t get fresh coconut here, and I prefer them fresh). I often use my home made non diary milks for smoothies. Hemp milk is one of my favourites as it’s so easy to make and creamy. So glad you like it and love your recipe for hemp milk too!! Hope some of the smoothies are low carb for diabetics. I try to stick to 30 net carbs for breakfast. Happy New Year, my sweet friend! I’m so glad to hear that you got to enjoy some quality time with your husband! Tim had to work on Christmas and New Year’s day so that was no fun. I hope you feel better soon and that you’ll get to sleep a bit more this week! 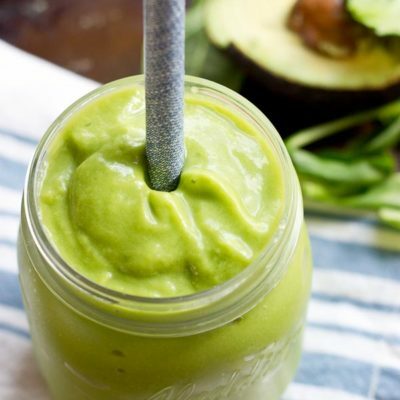 I just saw Deanna’s recipe roundup of green leafy veggies and now your green smoothie…you ladies are reminding me to add some more green to my diet! Min you are just the sweetest. Seriously, so thoughtful. I’m so so sorry Tim had to work over both holidays.. shouldn’t get at least one of them off? Not fair, but I hope next year you guys can spend them together. Hope you’ve had a great week girl.